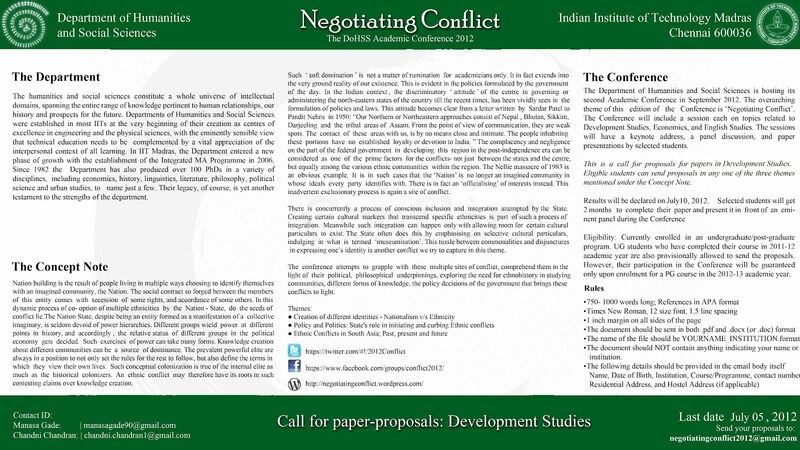 ← Academic Conference by the Department of Humanities and Social Sciences, IIT Madras. Within the field of Developmental Studies, the Conference looks to examine the conflicts arising out of ethnic differences. What are the forces that bind the peoples of a country to form a nation? How influential are power hierarchies in the functioning of a society? Do those in power truly play the role of internal colonizers? Could disparity between ethnicity and nationality lead to a conflict of identity? What role does the State play in this scenario? Does high ethnic diversity make South Asia different from the rest of the world? 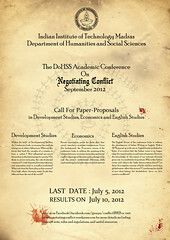 This entry was posted in Uncategorized and tagged Call for Papers, Development Studies, ethnic diversity, politics. Bookmark the permalink.